These little words cause a lot of trouble to language learners. Em, No, Na are prepositions. In this lesson you will understand what they mean and when to use each one. Eu estou em casa. = I’m at home. Em que estado você mora? = In what state do you live? Os preços subiram em média 6% em 2016. = Prices increased on average 6% in 2016. In Portuguese, prepositions agree in gender and number with the word that they refer to. In Portuguese, we contract the preposition Em with definite articles. The book is on the table. = O livro está na mesa. It seems like a lot to think about, but this is all going to be in autopilot in your brain soon enough. Maria está na praia. = Maria is at the beach. O gato está na cama. = The cat in on the bed. O leite está na geladeira. = The milk is in the fridge. Ela está sempre com a cabeça nas nuvens. = She is always with her head in the clouds. Tinha muita gente no show. = There were a lot of people at the concert. Meu casaco está no guarda-roupa. = My coat is in the wardrobe. Eu moro no terceiro andar. = I live on the third floor. Não sei o que fazer nos últimos dias das minhas férias. = I don’t know what to do on the last days of my vacation. Meu aniversário é em setembro. = My birthday is in September. Vou fazer uma viagem em março. = I’m going on a trip in March. Check out my video lesson on the months of the year. Also visit this lesson on articles and prepositions to use with the months of the year. This one is a little tricky since countries in Portuguese have a gender. I have a whole lesson on this topic. Visit the lesson here. Well, not really. There are different situations that may raise questions. As pessoas dão presentes no Natal. = People give gifts at Christmas. There are also cases in which we use the prepositions Em, Na, No meaning different things in English other than in, on, at. 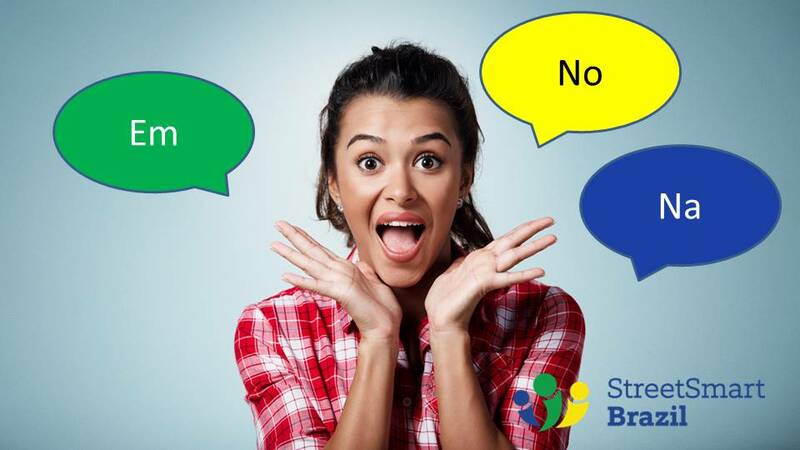 Today I wanted to help you understand the basic reasoning behind the use of em, no, na in Portuguese because having a solid foundation will make it easier to add complexity as you advance your Portuguese. I hope today’s lesson will help you speak Portuguese with more confidence. You know that practice makes it perfect, right? 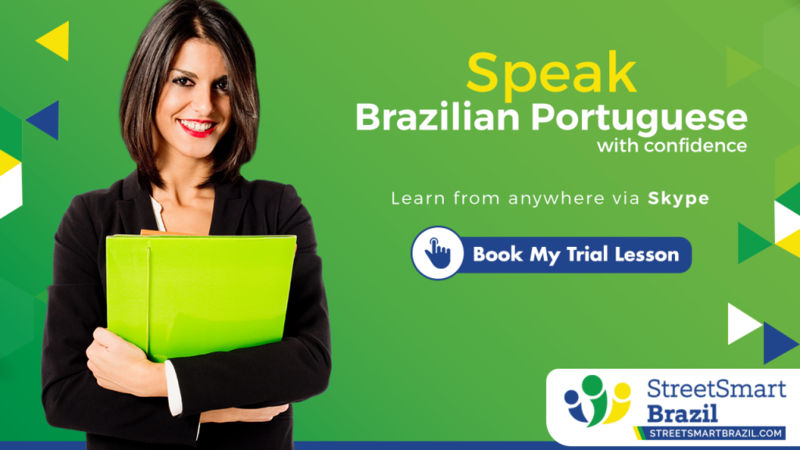 Advance your Portuguese with a Street Smart Brazil instructor! That’s a tough question. The language barrier is real. I hope you continue learning Portuguese. Thank you again for this lesson and many others. I have learned a great deal from you. You are an excellent instructor! Cities are usually gender neutral, so you use EM. However, Rio means river. And rio is a masculine word: O rio = the river. Therefore, you say No Rio. Thank you for sharing this information! It is really helpful. muito obrigado. My name is siva, i am from India. i want to learn full time Portuguese course. can you give the tentative budget. We currently have a sale on packages of 10 hours. You will see it in the link above.